With most government departments in the UK facing 20-25% cuts over the next year or so, DFID employees are sheltering behind a funding ringed fence. They must be pinching themselves at their good fortune. But their privileged position also forces them to be as penny-pinching as possible--if not, other departments will do the pinching. But how sturdy is the fence and are there any gaps through which resources can leak out? The fence is coming under increased fire. The recent article in the Daily Mail was particularly scathing. These attacks, in turn, generate stock responses about aid's all-conquering properties. In an era where the aid debate risks becoming ever more polarised we are in need of nuance. But for busy UK policymakers nuance is about as welcome as England having to face Germany in the round of 16 (I suspect this may not hold for German policymakers). can aid deliver the output or outcome? can these outputs or outcomes make a long term difference? can impact be demonstrated in a relatively short time period? You can see the potential contradictions. It is difficult to show the short term impact of things that can make a long term difference (e.g. investments in innovation in science and technology). Things that aid can deliver (e.g. more children in school) may not make a long term difference (e.g. if class sizes are so large that the average student's ability to learn diminishes). Things that aid can deliver (e.g. stronger health systems) can present problems for the demonstration of impact (e.g. in terms of lives saved). What can the development community do to make these contradictions more visible but less severe? The effort required to deliver a convincing answer often dwarfs the effort put into thinking about whether it was the right question to answer in the first place (e.g. why has no-one asked whether conditional cash transfers make sense in sub-Saharan Africa? Most of the effort has been spent on answering if cash transfers have an impact on hunger. Of course they do.). This means consulting with a wide range of stakeholders about the questions worth asking (see "this book fills a much needed gap"). The "randomistas" and even the quasi-experimentalists often answer the question "does it have an impact? ", sometimes "for who? ", but rarely "why?". This requires innovative issue-driven blends of quant and qual. It will always be more challenging to evaluate policy changes that generate consequences that are indirect and lagged, for which indicators are not yet developed, and for which all the pathways of change are not yet fully understood. But we must help to expand the set of things that are "evaluable" by developing methods to consider these dimensions. Your idea of success is probably not the same as mine. Add in experiential, cultural and value differences and the gap may widen. Getting multiple views of success from different stakeholders will help to home in on what really counts and help uncover unintended consequence land mines further down the road. Most methodologically rigorous analyses--whether quant/qual or some blend--have, by definition, high degrees of internal validity. They are fit for purpose in the context in which they are applied. But by building in more variation and diversity - either within the context or across it by, say, systematic case study meta analyses--we can make plausible guesses about how portable an intervention is and the associated risks of assuming it is. In short the development research community must nuance the impact debate, not disown it. If we do the latter, then aid will only be used for things where it is easiest to demonstrate impact and the rest will be wrung out of DFID, despite the ringed fence. We need to expand the radius of evaluability if we are to help protect the parts of the aid spend that may do the most good. 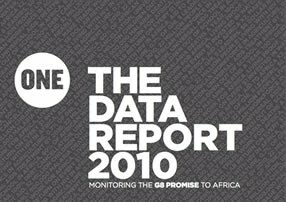 Last month One.org released their DATA REPORT 2010: Monitoring the G8 Promise to Africa. It just hit my desk today. G7 commitments on aid to Sub-Saharan Africa have been more than half met. The target increase for 2009 was about $18bn, with actual G7 increases standing at $9.9bn. investments in agriculture, primary education, malaria, HIV/AIDS and child survival are rated as good, but water and sanitation have lagged behind. lessons learned: need to engage with new partners (e.g. new non G7 donors); accountability of donors and African governments is key; Africa is "teeming with new opportunity"
The way forward says that no group of countries have put forward a comprehensive and collective plan focused on how to help support the vision of "an Africa driven by its own citizens", but it would have been useful to provide a forum in this report for African voices to say where and how they would like that support to be focused. This is the last in a series of very useful reports, but I hope the next set will be less about aid and more about development and less about donors and recipients and more about development partners. I also hope it will be led by Africans. 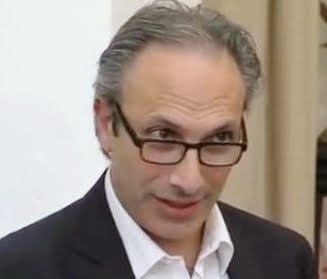 I attended a Panos London Board meeting yesterday. Panos London is an NGO focusing on communication: voice, dialogue, ICT and media in areas such as climate change and public health. It is doing a lot of innovative work and I urge you to check them out. At the end of the Board meeting I participated in a panel on "From Emails to Firestorm: the role of the Media in Climategate", set up to coincide with the completion of the UN Framework Convention on Climate Change meetings in Bonn. Six months on from Copenhagen I argued that the "climategate" fiasco set up 3 tests of trust for the science community -- and that we failed two of those tests. First, the trust in the credibility of the science base. This was attacked for sure, and took some hits, but my sense is that it emerged bloodied, not bowed. That's largely because of the multi-sited nature of the IPCC. It's not seen as a rich country club--it brings together perspective from all over the world, and because of that roundedness, it is more resilient to attacks from the media and elsewhere. So I think we passed that test of trust--just about. I think we failed the second test, however, and that is the test of communication. Science is not easy for most scientists to communicate to nonscientists, and much of the furore could have been prevented and dampened with better communication: why were the data "altered"? What does "altering" mean? What are the uncertainties around the conclusions? Which phenomena can't be attributed to climate change? If you don't agree with me does that mean you are against me? When public opinion is with you these questions seem less important, and when the tide inevitably turns you realise how ill-prepared you are. We need to spend more time and care in dialogue with the media, resisting the temptation to polarise the debate. Third, we failed the information openness test. By not releasing publicly funded climate data it looked as though something was being covered up. The scientific process is also stymied by this. No-one is covered in glory by this withholding. Scientists (including social scientists) have to realise that they do not own the data--especially when it guides public money spent on public goods. They may have spent a long time getting it into the necessary shape to analyse it, but surely their rights are to first analysis, not lifetime patent. The story cannot be about the withheld data, it must be about what the data say to a range of different researchers. If there was one thing the research councils and DFID could do to vastly increase the value for money of research they fund and build trust with the media and public, it would be to incentivise open access data. Today the Royal Society hosted the launch of the STEPS Centre Manifesto on Innovation, Sustainability and Development. STEPS is supported by the ESRC and hosted by IDS and by SPRU at the University of Sussex. The Manifesto draws on work that STEPS has done over the past 4 years and over the past year it has been co-developed in over 20 roundtables from around the world, a process convened by Adrian Ely of SPRU. The Co-Directors of STEPS are Melissa Leach and Ian Scoones of IDS and Andy Stirling of SPRU. The starting point for the Manifesto is the massive disconnect between ever expanding volumes of research and development in science and technology (S&T) and the persistence of poverty, social injustice and environmental damage. How can these resources be made to work for goals that go beyond commerce, beyond economic growth and beyond simple private gain? Direction – often we think that the dominant pathway of innovation is the best one. But often this is simply a reflection of path dependence in investments or a manifestation of the power held by those who support the pathway. In reality there are many candidate pathways if we can only open up spaces for them. Diversity – this has to be deliberately constructed – otherwise the most powerful will drown out the rest. Diversity is important because it is a hedge against an uncertain future and it can throw up creative and previously unimaginable questions, pathways and options. Distribution – diversity, yes, but what kind of diversity? The poorest and most marginal are those excluded from choices about which science and technology is prioritized. These voices must enter the debate in ways that give them some chance of influencing the debate. • Agenda setting—who decides what are the key questions to address through S&T? • Funding—what are the institutional incentives to align public and private S&T spending towards poverty alleviation, social justice and environment? • Monitoring, Evaluation and Accountability—measure the effect of S&T on things we really care about, report funding allocated towards development goals, report back to national parliaments on the 3 D impacts of investments in S&T. Overall, the Manifesto team was commended for its vision, energy and inclusiveness. Many opportunities for influencing were noted (ranging from the UK’s Research Excellence Framework to DFID’s Emerging Technologies funding window to the new Government’s focus on transparency and accountability). The key question for me was “does the Manifesto action agenda rely on a powerful actor seeing the light?” If it does, how will this happen? Can it be accomplished by mobilizing civil society? Or will the action agenda have to bypass the powerful status quo organizations and rely on change from the emerging voices who are at the margins now? The STEPS team knows that these kinds of changes don’t come quickly and they were clear that this report is just one moment in a longer process. The Chair of the ESRC, Alan Gillespie, reminded us how long change processes can take. In reflecting on the original Sussex Manifesto from 1970 he noted that the report called for the UN to establish clear outcome orientated development goals. The MDGs were established 30 years later. Being born in South Africa I had to find a reason to get a cheesy picture of the World Cup into the blog. 1. What are the economic determinants of World Cup success? 2. What are the economic returns to hosting a World Cup? On the determinants, some very serious econometrics have been dedicated to this issue (see this one from the International Association of Sports Economists!). Population seems to matter more than GDP/capita and past performance in Cups seems to matter more than the proportion of professional footballers in the population. Being the host country is important for success. Goldman Sachs also get in on the act with their World Cup and Economics Report--they find little correlation between a country's 2009 Growth Environment Score (GES) and FIFA football rankings although improvements in the GES are correlated with improvements in the FIFA rankings. Their picks for the semi finals? England, Argentina, Spain and Brazil. More important, what are the economic returns? This is more serious but very difficult territory. What has been the infrastructure addition? Is it multi-use? Was it geared towards labour intensive job creation? What has been the increase in tourism? Have football tourists spent more than non-football tourists? What have been the spillovers in terms of kickstarting sport, tourism, and opening up the country to new investments? The evidence is all over the place (where are those systematic reviews when you need them?). For a country like South Africa, with unemployment rates of about one third, this is no joke. We know that public works projects can have very different impacts on poverty depending on how they are designed (some work I was involved in in the late 90s showed that for 100 public works projects in Western Cape, the ones led by communities were the most cost efficient at transferring resources to the poorest), so it will be interesting to see how many jobs were created and if the differences at the 10 stadium sites and economic hinterlands can be explained by process, institutional and infrastructure design features. However the most interesting paper I found from a quick look argues that it is the non-economic impacts, especially the internal "psychic income" (estimated using contingent valuation technique) that really matter when economic communities invest in large sports events. Civic pride, identity and a sense of belonging really seem to matter. the finest, but also one of the economically most long-term effects of the 2006 World Cup." I hope you enjoy the tournament and the positive image of Africa that it will surely present. My pick: Spain. Any team that cannot find a regular place for Cesc Fabregas must be seriously good. Can DFID Leverage Reform in the Multilateral Aid World? DFID, as part of its review of spending has launched a review of its multilateral aid spend. Is the UK taxpayer getting value for money from 30 or so global organisations? Let's look at some of the potential criteria. Transactions costs. Channeling money through multilateral aid agencies may reduce transactions costs for recipients and for bilateral donors. But on the ground, countries still have to deal with 30 or so bilateral donors and 30 or so multilaterals. In addition the UK taxpayer may simply be paying two sets of administrators--in the UK to get the money out and in Washington, Rome and New York to allocate the money. Ownership. Can multilaterals support government systems better than direct budget support? I'm not sure. And I'm not even sure the best way to find out-who to ask? Civil society in the South? Recipient Governments? The new Aid Watchdog? Impact. It is harder to demonstrate to donor citizens that their taxes are having a particular effect when resources are pooled in multilaterals. Interesting to note that the main point made by the International Development Select Committee when they reviewed the DFID-World Bank relationship in 2008 was that the World Bank needed to do better on making impact a central part of how it measured its effectiveness. Credibility. This depends on governance and representation. While the heads of multilateral agencies bypass standard human resource best practice (job and person description, open competition, selected on merit by internals and externals) it is hard for these agencies to lecture on governance. On representation, change seems to be happening very slowly. Perhaps the multilateral review can incentivise some movement along these lines. There are lots of people out there who are much more knowledgeable than I am on these global public goods issues. I would love to hear from you. The events of the past 2-3 years should have re-focused the development community's attention on ethics, faith and morality. The Global Financial Crisis has made a few of us turn our attention again to the values underlying the global economic system. Climate change has highlighted the purpose of consumption int he rich countries, and has forced us to consider tradeoffs between our consumption opportunities and those of future generations. 1. these faith based organisations clearly felt that trust in outsiders is vital if outsiders are going to have any traction, and that being identified as "faith based" is very helpful in establishing such trust quickly--even across faiths. 2. the organisations are actively questioning the very nature of progress. For example, CAFOD, Tearfund and Theos are involved in a project considering Human Flourishing in development which will be launched in the Autumn. Here is one background paper from Bath University on this issue. 3. they feel they have a lot to contribute to the current debate about the effectiveness of aid. Through their strong local connections and trust dividends they think they can contribute a lot to assessing impact--both in terms of defining impact from the recipient perspective and in terms of getting feedback on what is and is not working. The ideas from this roundtable will be more fully reported back to this group and will influence the Reimagining Development Report due out later in the year. Social protection refers to a set of interventions that seek to help families protect themselves against shocks, protect the assets they have, and climb out of poverty. A new report by the Centre for Social Protection argues that, in sub-Saharan Africa, social protection may have lost its way. Despite lots of donor investment, many African governments remain reluctant to embark on the high recurrent costs of social welfare and the political irreversibility of its introduction. The report suggests a change in emphasis. Instead of introducing a plethora of pilots that use imported recipes, focus on the objectives of social protection--vulnerability and poverty reduction--and build on existing government initiatives, innovating and experimenting with these as they are strengthened. Importantly, the report recommends that African citizens are more involved in the upstream design and the downstream evaluation of such programmes. It is noteworthy that the biggest global successes in social protection come from Mexico and Brazil and these were home grown ideas, financed by a mix of domestic and external finance. But the picture is not that simple--it's not as if there are legions of African leaders straining to get their homegrown social protection policies financed. A report released last week from Kofi Annan's African Progress Panel highlights the disconnects between African countries' GDP/capita growth rates and the continent's lack of progress in poverty reduction. This, it is argued, is the result of weak leadership, capacity and governance. This puts a premium on the donors being politically nimble and switched on to the policy process. Country-led opportunities for strengthening social protection in Africa will not be commonplace. When they arise, the donors must be ready--not to produce their own solutions but to support the reformers working in the countries they are trying to help.